Click the picture above to view the full schedule. Thanksgiving weekend marks not just the holiday season but also the start of this year's boys' high school hockey season. For those hoping to avoid the frenzy of Black Friday, The Opener, hosted by the Youth Hockey Hub, offers a hot ticket for hockey fans at Bloomington Ice Garden. Minnetonka, the defending Class 2A champion, faces St. Thomas Academy in the tournament opener on Friday, Nov. 23, and after a 5-4 overtime loss to the Skippers in last year’s matchup, the Cadets will be seeking revenge and to make a statement. Lakeville North and Cloquet-Esko-Carlton will face off in the nightcap. Henry Sibley, St. Paul Academy, New Ulm and Somerset (Wis.) will have a chance to play at TRIA Rink — the Minnesota Wild's new practice facility that's also home of Hamline University's hockey programs and the Minnesota Whitecaps — in downtown St. Paul in a two-day tournament that Friday and Saturday. Two weeks later, Class 2A, Section 7 rivals Duluth East and Andover collide in a tilt that’ll likely have heavy sway on playoff seeding on Dec. 8. The Greyhounds defeated the Huskies 3-2 in overtime of last year’s section final to advance to the state tournament. In a meeting of young versus prevailing powers in the west metro, Chaska faces perennial juggernaut Edina on Dec. 29 in the final day of the Hockey For Life Classic at the Dakotah! Ice Center in Prior Lake. Entering the new year, Roseau and Warroad will celebrate the 75-year anniversary of one of the state’s most treasured rivalries when they play on Jan. 10 at Gardens Arena in Warroad. Five days later, a budding rivalry between Class 1A, Section 7 foes Greenway and Hermantown takes place after the Hawks survived a 5-4 double overtime thriller to advance to their ninth consecutive state tournament. Hermantown finished third last year after winning the previous two small-school crowns. The Hawks are hoping to reassert themselves at the top of Class 1A, while defending champion Orono will be fending off a flurry of contenders. The Spartans face a strong returning cast of St. Cloud Cathedral players in Orono on Jan. 12. 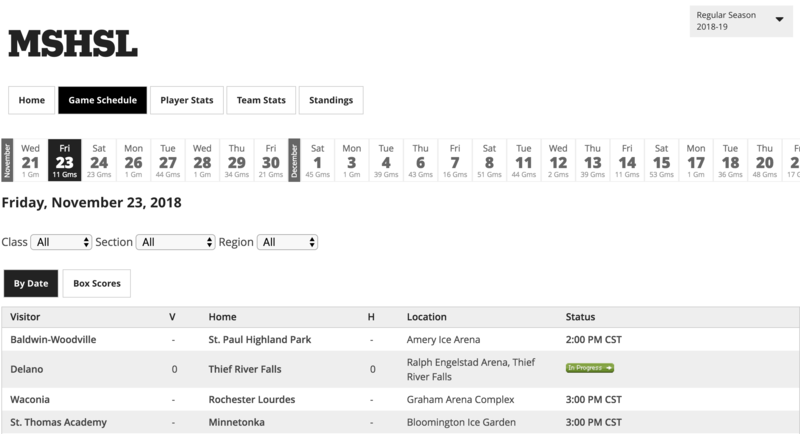 If your team’s schedule isn’t posted or needs updating, send the necessary information to scores@sportsengine.com.